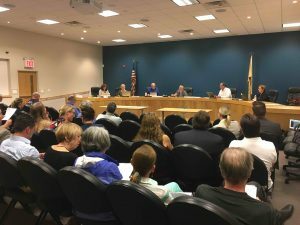 After Lambertville Mayor David Del Vecchio and City Council approved a notable plastics ban during the Sept. 17 Governing Body of the City meeting, an ordinance that would authorize $191,900 in general improvement bonds to finance the purchase of another garbage truck for the Lambertville Public Works department was considered. In attendance was Democratic Mayoral Primary Nominee Julia Fahl, who raised concerns over how much debt the city was accruing over the past fiscal year, as well as the city’s use of department of corrections workers for trash and recycling collection. Fahl pointed out that issuing of bond for the new truck would add another $240,000 in debt. Del Vecchio responded that the correct number to be bonded was $191,900. City Secretary Cindy Ege noted that Lambertville lost two backup trucks in a fire, which cost $20,000 and currently the city does not have backup trucks for trash collection. Lambertville Mayoral Democratic Primary Nominee Julia Fahl speaks at the Sept. 17 Governing Body of the City Meeting. 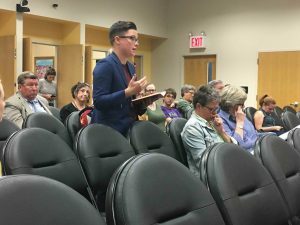 Another resident spoke about the use of department of corrections workers, calling it “prison labor,” commenting that the city should be paying them minimum wage. Fahl then spoke about public works spending “a majority of their time” picking up trash, and suggested they should be freed up to work on parks and buildings maintenance. “Our public works department basically functions as a sanitation department right now,” she said. Fahl responded that the vote was almost eight years ago. Both were referencing a 2011 special election where 59.02% of voters approved raising the property taxes over the state mandated 2% cap, which allowed garbage collection to be included in property taxes, instead of as a separate bill. Fahl continued, “Before we bond more debt on this issue, let’s have a discussion with the city on how this all works,” and requested that the mayor and council provide a debt plan list from now until January. The Council moved to table the vote on the truck ordinance until the Tuesday, Oct. 16 Governing Body of the City meeting. Steve Chernoski - Steve Chernoski is a writer, film director and teacher who lives in Lambertville. Here's his website: http://stevechernoski.com.